We create the most beautiful music we can because God is worthy of our best efforts. There are no auditions. ALL are invited to participate. Children’s music programs teach age-appropriate musical skills and knowledge, celebrate faith through music and provide fun fellowship. Our bell choirs are especially good for learning the basics of music. their musical talents to fund raise for others. 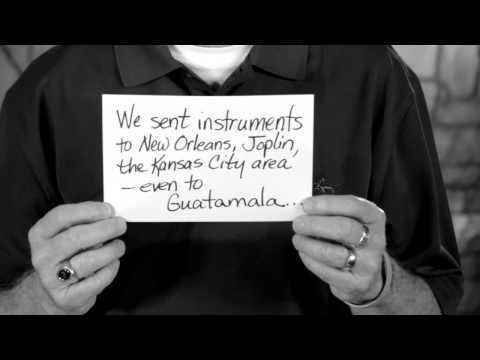 High school mission trips include taking music to places in need of comfort and community. Our high school Youth Band plays in worship services at our church, and at events throughout the Kansas City area. Hear our senior high choir Exaltation! Adult programs provide weekly worship leadership in two styles and special music for important times in the church calendar. There are opportunities for everyone from beginners to professional musicians. We involve many non-musical volunteers to keep our enormous program organized and filled with love. This ministry touches every single member of our church family. Whether we sing from the choir loft, ring from a table or sing in the most important choir of all—the one sitting in the pews–all of us are transformed and lifted to God in sacred sound. If you would like to know more about the Grace Covenant music ministry, please contact Rebecca Prater. For more details on our music ensembles, please click here. It is a question we are never done asking or answering. Grace Covenant acts to ease immediate suffering, but also works to bring justice to the systems that prevent people from enjoying safe housing, good education, healthy food, equal rights and adequate medical care. We work to make our congregation carbon-neutral and also to inspire all in our human family to care for God’s creation. We believe love is love and work for a world where those of minority sexual orientation are treated with equality both inside and outside the church walls. Locally, nationally and internationally we find ways to act and advocate for all God’s wonderfully diverse creation. In serving others, making peace and working for justice, we draw closest to Jesus. This is the work that heals us. Kairos is a ministry team of advocacy and action. Our efforts toward hunger alleviation include creating Grace Gardens to provide fresh produce to a local food bank, sustained support of national and international programs to feed the hungry, and sales of fair trade products every Sunday. Our action and advocacy for peace issues, immigration reform, LGBT rights and prison ministries is also local, denominational (Presbyterian Church USA) and national. One of our greatest passions is Creation Care through programs of energy efficiency for our own church building. The Mission Team allocates Grace Covenant resources (dollars and volunteer hours) to local, national and international service organizations which focus on homelessness, education, healthcare, hunger alleviation and support for developing countries. Mission supports national and international mission trips and seeks other opportunities for members to be involved in meaningful work that makes a difference through Grace in Action. Grace in Action is our quarterly mission volunteer program. One Saturday morning each season we meet to participate in one of several activities offered. The activities vary, but there is something for all ages and abilities. Activities last approximately three hours. This is an easy, hands-on way to serve our community, especially for families with young children. Grace Covenant Presbyterian Church is a great place to discover the best way you can serve. In times of joy, in times of great struggle and in all the between times, we seek to live in ways that reveal God’s love. Deacons are the heart and soul of that commitment. Each deacon leads a Covenant Group of 15-20 families and individuals who provide meals, cards, hugs, transportation—whatever is needed—to help each other through the roller coaster of life. The groups also socialize and serve the church and community. Every two years we mix up the covenant Groups again so there are always new friends to meet. The Connections and Care team guides the work of nurturing for all of us. They organize the big, fun events and they organize many of the little ways we connect to each other as well. GCPC is a good place to be when you need care and especially when you long to bring loving care to others. To hear a few personalized stories of what this community of caring looks like in real life, watch the videos below. For more information about small groups at GCPC, click here.